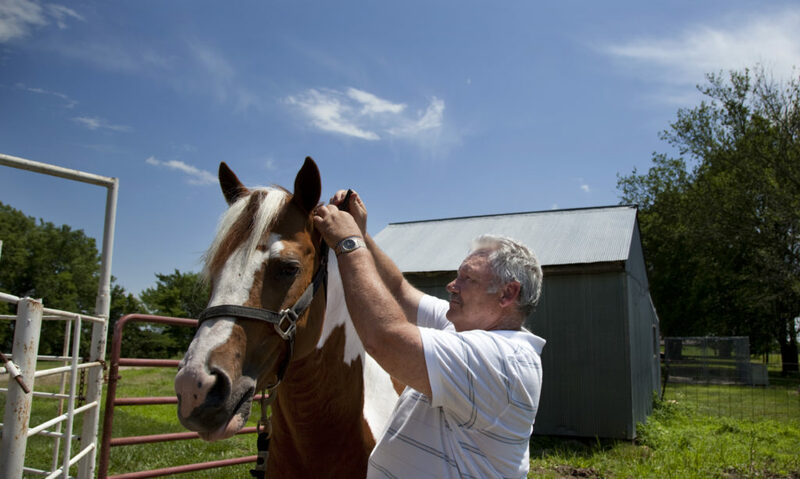 Jim Borgeson adjusts the headstall around his Tobiano paint quarter horse, Toby, at their ranch in Baldwin City. Borgeson and his wife, Sharon, operate a charity with Toby where money raised through Toby’s stud fees are donated to various Christian causes. For those who believe, God manifests meaning in a variety of ways. For Jim and Sharon Borgeson, that meaning was clear the second Sharon locked eyes with an 18-month-old Tobiano stallion at a farm auction in 1996. But he wasn’t what they had in mind. The couple were at the auction looking specifically for an older gelding, one they could ride at their ranch in Baldwin City without the headache of training and breaking. The white and red paint horse was wrong in every way — too young, unbroken and definitely not a gelding. But the eyes told them to give it a shot, and with one $3,000 bid, they loaded up the horse and hoped they made a good decision. Fourteen years and thousands in charitable contributions later, they say it’s clear they made the right choice. That horse, now named Toby (short for Tobiano, though his real name is Thirsty Peppy), has helped thousands of people through Toby, The People’s Horse Inc., a ministry for those in need. The money has gone to people in the United States and abroad in countries like Costa Rica and Nicaragua. To send donations to Toby, The People’s Horse Inc., write to: Toby, Box 834, Baldwin City, KS, 66006. Toby does get a lot of that money through donations, but a good chunk of the money also comes directly from Toby himself. How? With each $550 stud session, $400 goes directly to the charity, with the remainder going to the breeder. It’s an unusual way to fund a Christian organization, to say the least, and that’s not lost on Sharon, who says she and her husband get asked a lot about Toby’s true involvement. However confusing, the method for funding the charity fits in perfectly with God’s plan, says the Rev. Bob Giffin, the Borgesons’ pastor at Lawrence First Church of the Nazarene, 1470 N. 1000 Road. Borgeson asked Moore what he meant, but Moore held back, choosing to let Borgeson’s mind wander. Later, deciding to act, the Borgesons trained Toby for reining competition, and soon he had placed first 12 straight times and the credentials to be a sought-after stud. Soon after, the business model for the ministry was formed, and the Borgesons began buying up Wal-Mart gift cards to give to those in need. Glen White, a member of Toby’s board, has worked as one of the horse’s “agents” — helping the needy during a trip to Peru. There, he met a group of disabled women hoping to play athletics as a way to toe into Peruvian society. White soon begin buying sports gear with money from the ministry. “Many of these individuals have very low incomes and could not afford this equipment on their own,” White says. The Borgesons themselves have worked as Toby’s agents in Nicaragua. This fall, the Borgesons will head to the country for the fourth time, this time to supervise the building of a church there paid for with Toby-secured funds. Toby’s never gotten to go to Nicaragua himself, but this summer, a little bit of him will touch down there. A few months ago, the ministry was gifted a mare, named Red, by a Baldwin City woman. Red is now pregnant by Toby, and she soon will be headed to Nicaragua. There, she will give birth, and the hope is that another arm of the ministry will be born in Central America, thus continuing Toby’s legacy.